Large selection of cold-pressed olive oils from the Italian region of Tuscany. From Tuscany not only first-class wines such as Chianti Classico or Brunello are produced, but also top quality olive oil: the olive oil Extra Vergine with protected designation of origin. In fact, olive oil production has a millennia-old tradition in this central Italian region, which is so popular the world for its unique landscape and cultural treasures. If you've traveled, the big old olive trees, standing alone or in small groups standing majestically out of the landscape, and the wide, gently rolling olive groves will not have escaped you. Below you will learn more about the particular characteristics of Tuscan olive oil and where and how it originates. Discover our top class olive oils! Tuscan olive oil is produced mainly from the local olive varieties Moraiolo and Frantoio. It is characterized by its fruity-fresh fragrance and its golden yellow color, which often has emerald-green nuances. 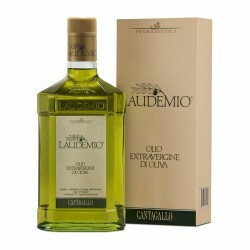 In the taste it presents itself spicy-fruity with aromas of freshly cut grass, artichokes and of course green olives. This is accompanied by a tart, slightly bitter almonds note, especially with freshly pressed cold oil: It is currently appreciated by the olive growers themselves, who in the time during and after the harvest would like to simply dip a piece of fresh white bread into the new oil or drizzle a slice of toasted bread with it - and test the quality of the new vintage! There is no better way to enjoy fine olive oil - give it a try! We have already told you the best and at the same time simplest way to enjoy the unique taste of olive oil from Tuscany just drop a few drops on fresh or lightly roasted white bread. Now spread a little spicy tomato and some rucola or basil leaves on it and you're done with the Bruschetta - a perfect starter, for which there are of course many more recipes. Of course, Extra Virgin Olive Oil is also great for salads - as part of light and tasty as well as healthy dressings. Olive oil has a firm place as condimento in the Tuscan kitchen: Some hearty soups like the famous Ribollita, a typical one Tuscan vegetable soup, or for grilled or stewed meat: such as the traditional 'Stracotto del Chianti', a roast beef in Chianti wine sauce. In all these cases, drip a few drops of olive oil just before serving on the finished dish to give it the icing on the cake of fresh spice. Give it a try! How much olive oil is actually produced in Tuscany, and when and how are the olives harvested? - Here are a few facts and figures: The fact that Tuscan olive oil is well known and widespread in this country, deceives that the share of Tuscany in the total Italian olive oil production is rather small: It is due to the occasionally very cold winter at only 4-5%, much lower than the southern regions of the country. For example, Puglia alone accounts for more than half of Italy's total production (51%)! During the 2014/15 season, 222,000 tonnes of olive oil were produced throughout Italy, of which just over 6,000 tonnes were produced in Tuscany. This very poor harvest, which was caused by unfavorable weather conditions and massive damage by the olive fruit fly, was followed by a good harvest year. In 2015/16, production rose to 474,620 tonnes throughout Italy and 19,202 tonnes in Tuscany - an increase of 113.8%. The Olive Harvest is always from mid-October to mid-December, with the main harvest time falling to November. For small and medium-sized growers, who pay attention to high quality and genuine taste, the harvest is always done by hand: The olives are picked either directly from the tree or combed or combed Rakes are detached from the branches and collected in networks previously spread on the ground. Another traditional method is the brucatura: it is beaten with long sticks on the branches of the olive trees. Mechanical harvesters are therefore taboo in quality-conscious Tuscan olive oil producers! A top producer from the south of Tuscany is Bardi Carraia : the company name is made up of the surname of the owner, Franco Bardi, and that of his oil mill. The olives come from centuries-old olive trees that grow on the hills around Siena. A little further north, halfway between Florence and Siena, are the olive groves of the Alfani family, who sell their multi-award winning oils under the label I Greppi di Silli - including the Extra Vergine Monocultivar Leccio del Corno, which is obtained exclusively from the very rare olive variety of the same name. Also in the province of Florence, more precisely on the Montalbano, is the estate Tenuta Cantagallo. It is run by the family Pierazzuoli , which also operates on La Farnete near Carmignano Produces olive oil. Read more about the producers, their products and awards in the appropriate information in our online store. On the one hand the "Denominazione di Origine Protetta" (PDO): protected designation of origin, recognizable by the red-yellow D.O.P.-seal. It means that all stages of production, from cultivation to processing, to manufacture and packaging in a particular geographical area, are carried out according to a recognized, agreed procedure. Second, the "Protected Geographical Indication", which in Italian is Indicazione Geografica Protetta. With this it is sufficient if only one of the three steps takes place in a certain region of origin. It is recognizable by the blue and yellow IGP seal. Toscano IGP Monti Pisani for the area east of the city of Pisa. The olive oils from the named regions of origin differ in terms of color, smell and taste, in particular the degree of fruitiness and the spiciness or seasoning.